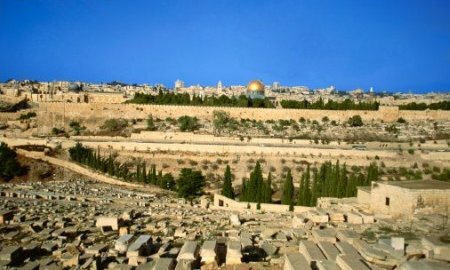 As one traces the history of Jerusalem throughout the Old Testament, it becomes quite evident it, in many ways, is a history of the Jewish nation itself. Though both existed apart from each other for many centuries, during the last 3, 000 years they have been intertwined. Perhaps it should come as no surprise that the history of Jerusalem is also one of incredible violence, death, destruction, and resiliency. Ancient Jerusalem sat centrally located within the mountains of western Palestine. It was a city of hills and valleys. At an elevation of 2,600 feet, Jerusalem belongs to a stretch of mountains known as the Central Mountain Range, or Central Ridge. Jerusalem sits nestled amongst the hills of Judea, a stretch of hills ranging over 60 miles from Bethel in the north to Beersheba in the south. 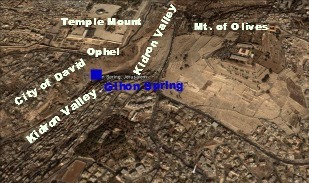 Bethel, the Mount of Olives near Jerusalem and the mountains of Bethlehem are all part of the same range. The hill country of Ephraim also incorporated some of this region. Steep ravines descending to the valleys below provided natural support to Jerusalem in the west, south and east. 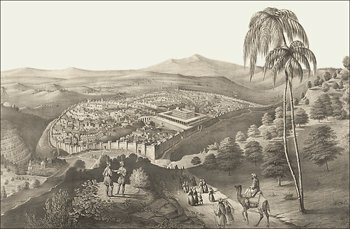 Though not located on any international trade routes of antiquity, Jerusalem was a strategic city in a strategic location. People were first attracted to the Gihon Spring. It is a natural spring and the only steady and reliable water source in Jerusalem, and one of the very few in all of the central mountain region. The Central Ridge is also the watershed. To the east of Zion wadis plummet into the Jordan Valley on their way to the Jordan River and the Dead Sea. To the west, water descends into the Shephelah and the many western flowing streams ending up in the Great Sea. Throughout Jerusalem's history the terrain has protected it in many instances, yet the city has its vulnerabilities, particularly in the north. Elevation in the region ranges from 2,000 feet to 3,300 feet above the Mediterranean Sea. Bethel was 2,900 feet above the sea, and ten miles north of Jerusalem. The higher elevations were in the south near Hebron. Jerusalem was nestled into these mountains surrounding her. 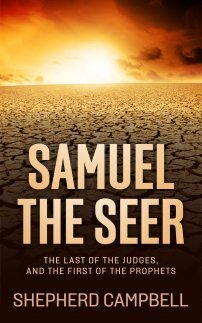 To the south and southeast of the city of God was a vast and formidable wilderness. The wilderness of Judea included the wildernesses of Zaphon and Maon, which lay further to the south of Hebron and made famous through the exploits of David and Saul. In the east, the Dead Sea collided with this desert-like region of mountain cliffs and barren landscape. Jerusalem has been heavily influenced by its geography. Click on a link below to view various topics and aspects on the city of Jerusalem. King David of Israel : The city of Jerusalem and the nation of Israel became intertwined under King David. He conquered Jebus from the Jebusites, renaming his new capital Jerusalem. King David forever tied together Jerusalem and Israel. Map of Jerusalem : This page explores the history of Jerusalem through various maps of Jerusalem. These maps explore the geography of both Jerusalem, and the surrounding areas. Map of Ancient Jerusalem : Trace this ancient city through its various stages and occupations. The map of ancient Jerusalem started with Abraham's encounter with Melchizedek. Ancient Jerusalem : By the time it is mentioned in the Bible, Jerusalem was already an ancient city. Ancient Jerusalem can be traced back to the Copper Age. Settlement and pottery date back thousands of years before Abram met Melchizedek in the valley of Shaveh. Jerusalem History : This page covers geographical and Biblical elements within the span of Jersualem's storied history, whereas the above focuses more on the pre-Biblical ancient history of Jerusalem. Abraham and Melchizedek are covered in this section, as is the importance geography played in Jerusalem's history. Jesus in Jerusalem : No period in history has left its imprint upon mankind like Jesus in first-century Jerusalem. The life, death, and resurrection of Jesus Christ changed mankind forever. These events took place along the streets of ancient Jerusalem. The Gates of Jerusalem : The Gates of Jerusalem line the walls of what is known today as the Old City of Jerusalem. They stand today as a testament to the antiquity and importance of this mystical city, and guard the entrance into the holiest area in the world. Jerusalem's history spans the entirety of the Bible, from the beginnings in Genesis, to the New Jerusalem of Revelation 21:9. It remains today as the focus of tension in the Middle East. In the 1948-49 Israeli War of Independence Israel captured West Jerusalem. East Jerusalem remained under Arab-Palestinian control. Upon the Israelite victory in the 1967 Six Day War Israel took control over East Jerusalem. Jerusalem once again became the capital of Israel. However, this move was not recognized by the biased and toothless United Nations, nor by the Arab world. Wednesday, May 8th 2013 marked the 46th anniversary of Jerusalem Day in Israel. This day commemorates the reunification of West and East Jerusalem under Israeli control. The history of Jerusalem continues to be shaped as this article is written. The Temple Mount remains under Muslim control, and will as long as the Dome of the Rock stands. This remains a source of contention. What does the future hold for the great capital of Israel? Whatever it may be, be rest assured that the God of Israel has the final say, and no efforts by the UN, Arabs, or any other entity will wrestle this city from its rightful heirs. The history of Jerusalem awaits its final chapter. Are You Interested in Jerusalem? Have you visited the Holy City? Do you have a story, article, or pictures you would like to share? Share your experiences with the City of God! All pictures must be in .jpg or .gif format. http://mariasmithcorner.tumblr.com PHOTOS AND STORIES ARE IN MY BLOG. THANK YOU SO MUCH.